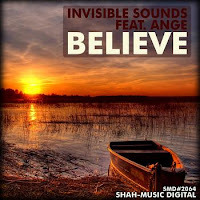 My second Friday's Trance Track of the Week is Believe featuring Ange (Lucas B Trance Vocal Remix) by Invisible Sounds which first was included in my August 2009 Ritual Purification and then September 2009 VOICES #1 mixes still rank amongst my favorite trance tracks. Click the artwork (at left) to preview the release from Beatport. You can listen to the entire Believe feat. Ange (Lucas B Trance Vocal Remix) on YouTube. And here are more Invisible Sounds releases at Beatport.